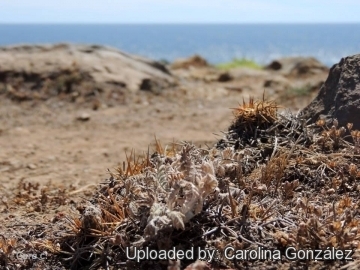 Origin and Habitat: Chile, North, South and East of Pto Pichidangui. 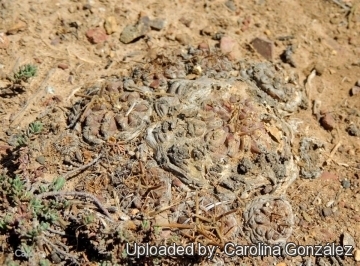 Description: Eriosyce curvispina var. mutabilis (Ritter) Kattermann (firstly described as Pyrrhocactus horridus var. mutabilis F.Ritter by Ritter in 1980) is a local or morphological form of the widespread and variable Eriosyce curvispina. It forms clusters and has ribs divided into tubercles, outwards directed spines and yellow flowers. However the distinguishing characteristics of Eriosyce curvispina var. mutabilis, appear to fall within the natural variation of Eriosyce curvispina and it should be synonymized with the latter. Stems: Frequently branching from basal areoles and forming little plantlets. Flowers: Yellow with variable reddish midstripes. Seed: 0.94-1.23 mm long 1-1.09 mm wide, ribbed, brown. 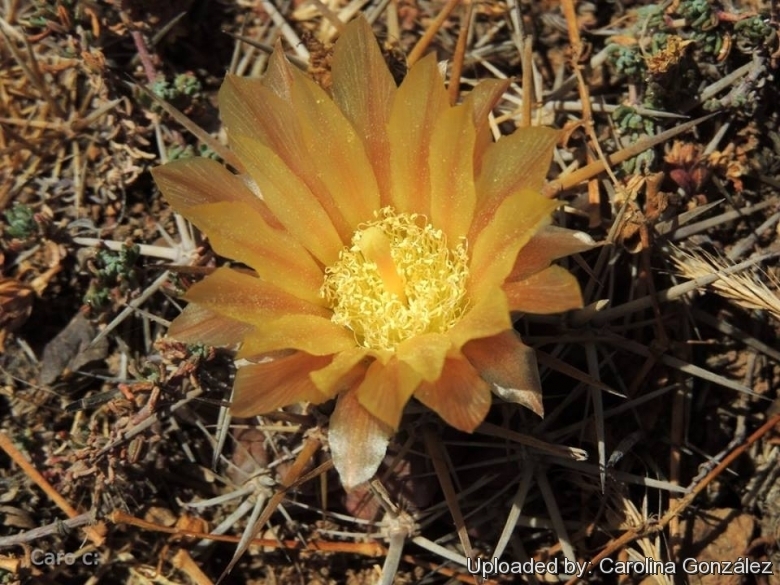 7) KATTERMANN F, JM LÜTHY, RS WALLACE, D HUNT, N TAYLO R & D ZAPPI “Eriosyce (Cactaceae): The genus revised and amplified.” (1994) Hunt D & N Taylor (Eds). Succulent Plant Research Volume 1. David Hunt Press. Surrey, England. Cultivation and Propagation: Eriosyce curvispina var. mutabilis is an extremely xerophytic, summer-growing, species, adapted to very dry soils. Despite its provenance it is not particularly difficult to cultivate, but quite susceptible to over-waterings and rot prone if kept in a non-ventilated place. Propagation: Usually propagated from seeds or graft. The seeds can be sown in pots of fine, well-drained sandy soil, any time during the spring when temperatures are warm. Cover the seeds with a fine layer of grit and water from below with a fungicide to prevent damping off. For the 1-2 weeks cover the pots with a sheet of glass/clear perspex to keep the humidity levels high. Remove the glass and replace it with light shade-cloth and mist once or twice a day for the next two weeks after which most seeds should have germinated. From then on mistings can be reduced to every second and then every third day as the little plants grow. The seedlings should not be disturbed until they are well rooted after which they can be planted separately in small pots. Sometimes it is grafted to avoid root rot problems as plants grafted on an hardy stock are easy to grow and no special skill is required.